Intramuros (literally “within the walls”) is the former center of Spanish colonial power and the Catholic Church in the Philippines. 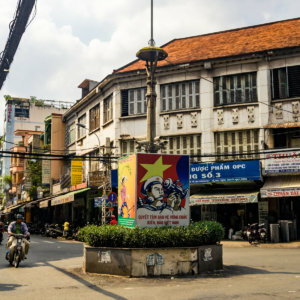 Located in the heart of old Manila, this fortified district has a long and complicated history stretching back more than four centuries, but little of what remains is original and untouched. 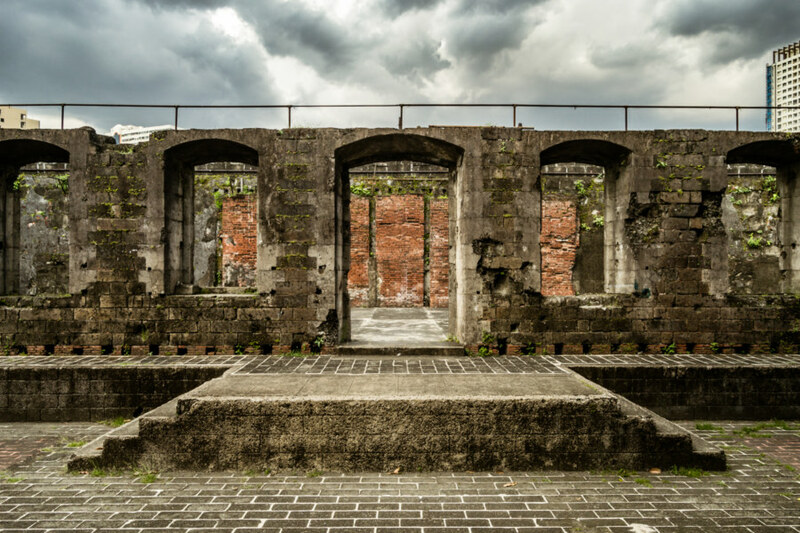 Intramuros was heavily damaged during the Japanese invasion in 1941 and almost completely destroyed in the Battle of Manila in 1945. Almost everything seen in my photos was reconstructed beginning in the 1950s and continuing to the present day. 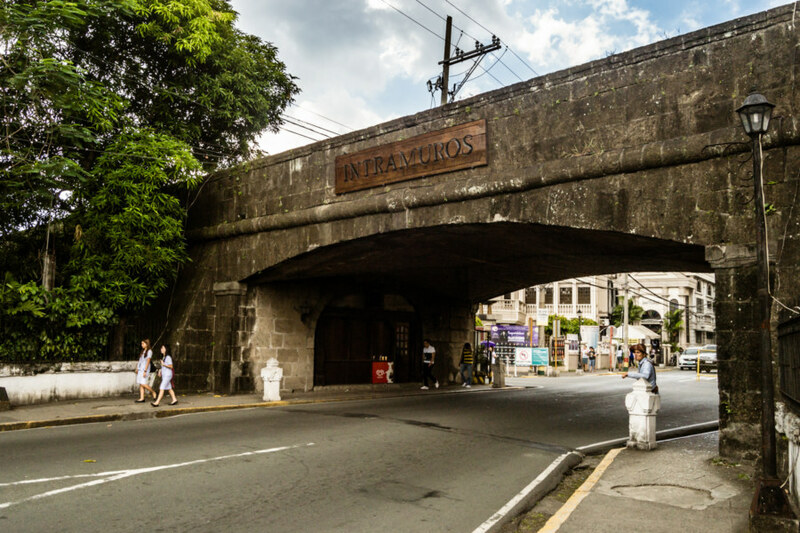 The southern entrance to Intramuros, Manila. 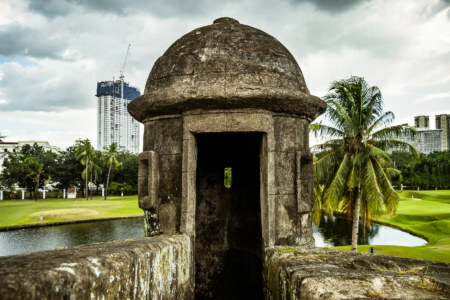 This watchtower now overlooks a golf course rather than the double moat of colonial times. 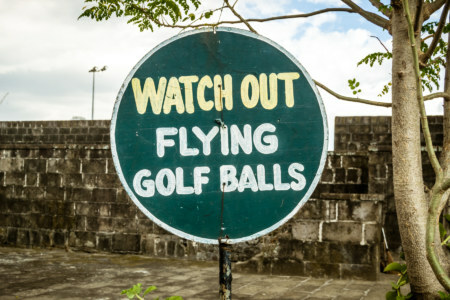 Watch out for flying golf balls: little effort is made to retain an authentic feeling along the walls. 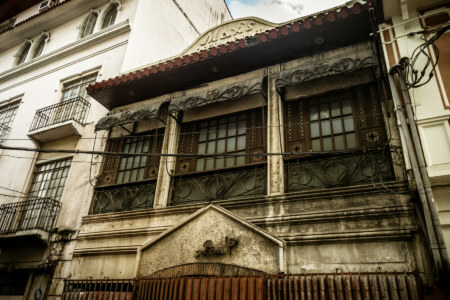 Intramuros is home to a patchwork of buildings, some old and historic, and others less so. 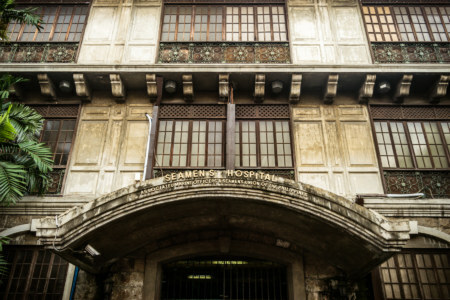 The Seamen’s Hospital, located near the southern entrance to Intramuros. 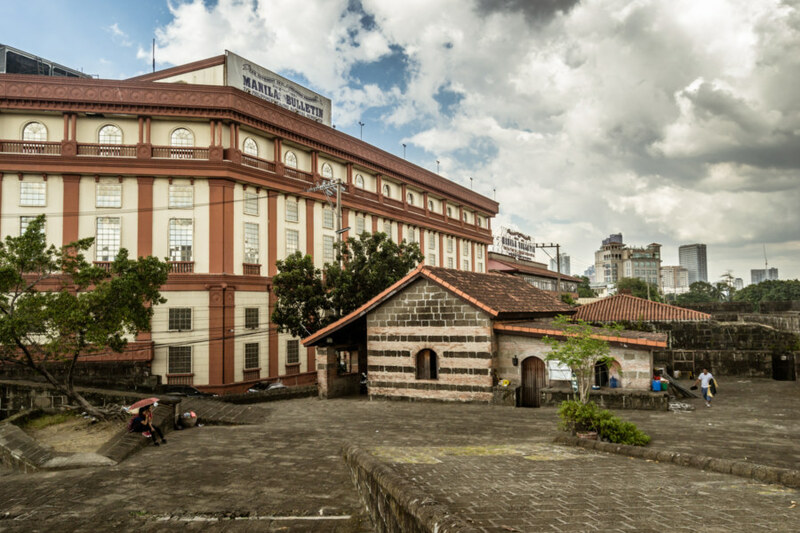 Manila Bulletin and the outer walls of Intramuros. 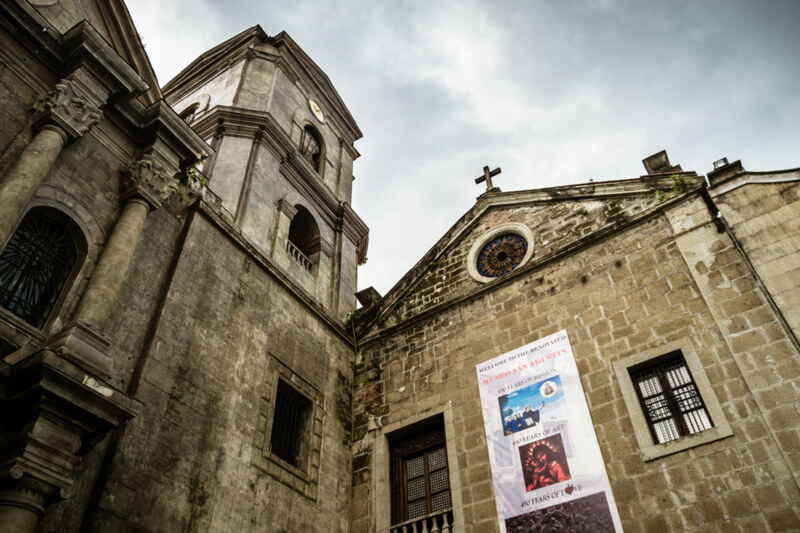 The newspaper is located on land formerly occupied by the San Nicolas de Tolentino Church, another precious piece of Filipino heritage lost in the war. 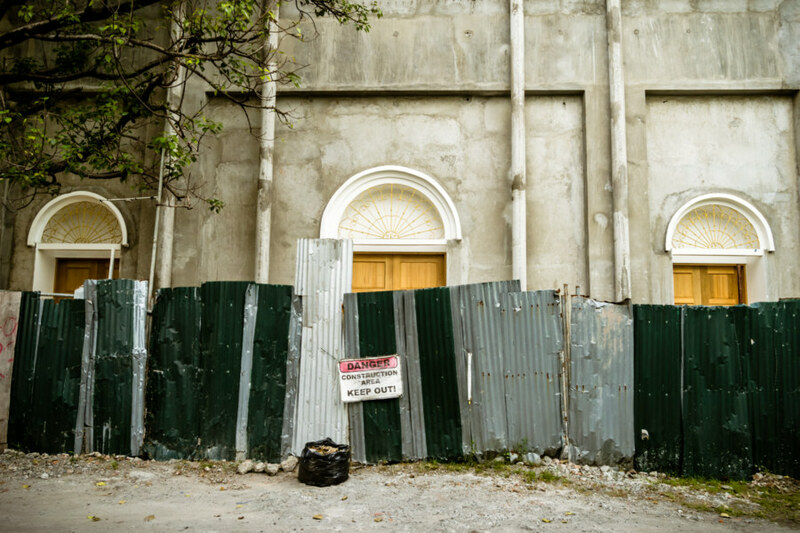 Under construction in Intramuros. I went to take a closer look but was waved away by an angry old man. 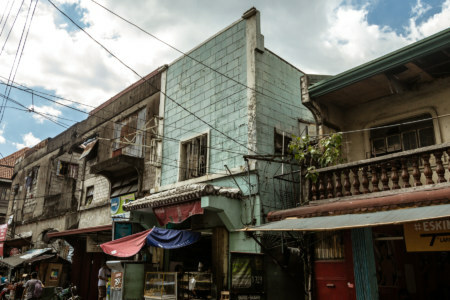 I captured these photos on a long day of exploration during my first trip to Manila in November 2015. 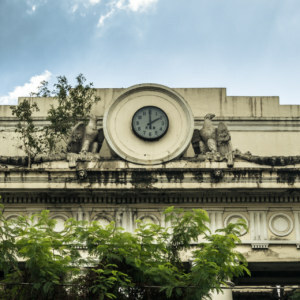 I started with a brief stop at the ruins of Paco Railway Station before enjoying an excellent brunch buffet at the Bayleaf Hotel in Intramuros. Fully sated, I spent a couple of hours aimlessly wandering around the old walled city and attached fort before breezing by the Aduana Building on my way to the historic Manila Metropolitan Theater. Finally I crossed the Pasig River into Binondo, Santa Cruz, and Quiapo, primarily to scope out Art Deco architecture around the old downtown core. 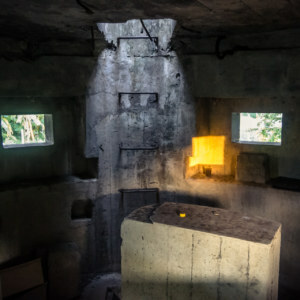 Whereas my work in Taiwan is informed by years of experience these photos were all shot on my first day of poking around the more historic parts of Manila and, since I am nowhere near as knowledgeable about what I captured, I’ll mostly let the photos speak for themselves. San Agustin Church, the only major landmark still standing in Intramuros after the liberation of Manila in 1945. 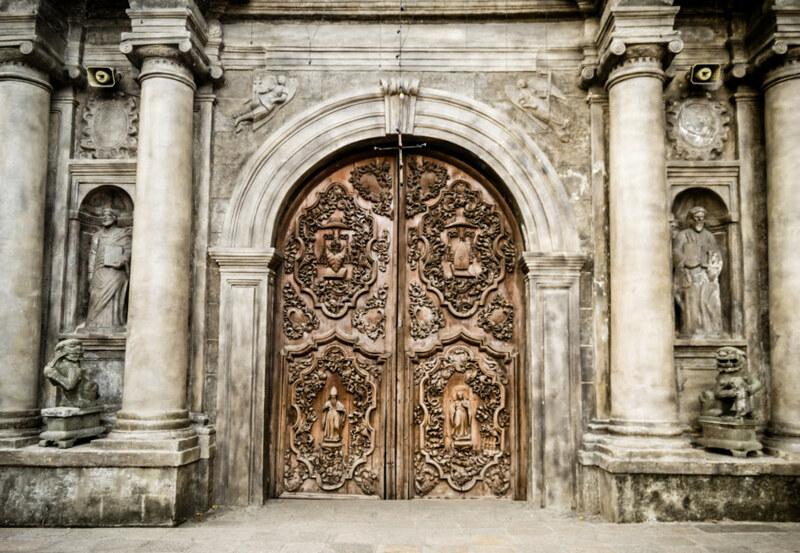 One of several ornate entrances to San Agustin. 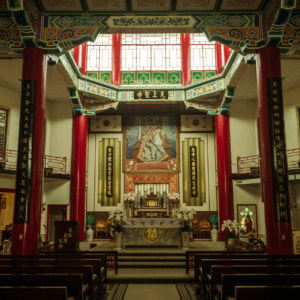 Notice the two Chinese-style guardian lions on either side of the doorway? Guardians of the sacred portal. A broken stone lion in front of San Agustin. 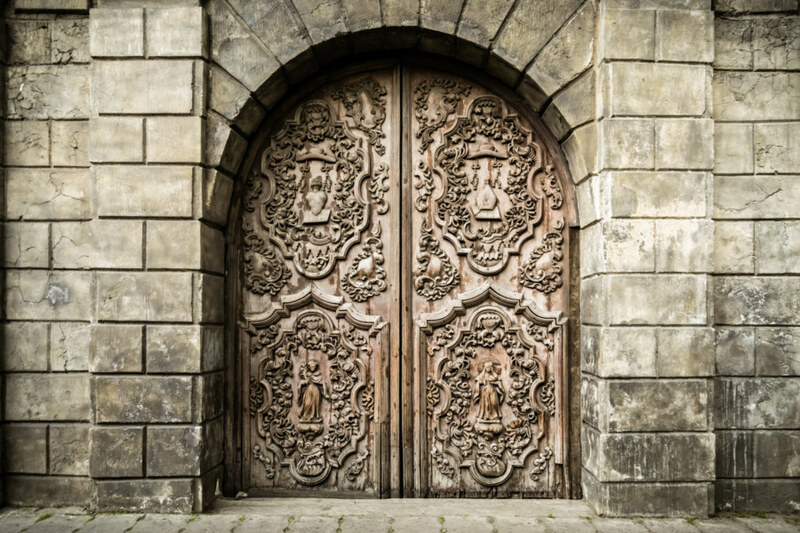 One of the side doors at San Agustin Church. San Agustin Church is the only major landmark to survive the liberation of Manila in 1945 (for reference, check out this incredible aerial photo of Intramuros in 1945; the church can be seen at top right). The first church in Manila (and indeed, on the entire island of Luzon was founded on this site in 1571 but it wasn’t until 1607 that a stone church was constructed and consecrated here. 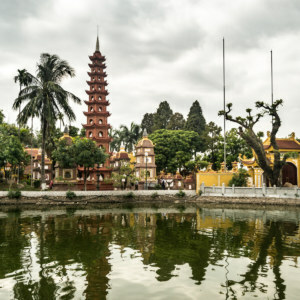 The original structure has survived numerous earthquakes and wars and has been renovated and restored numerous times over the centuries. 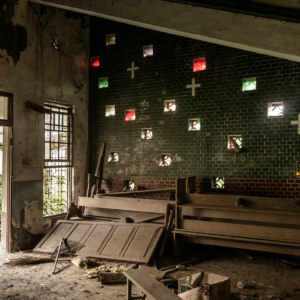 More recently it was designated a UNESCO World Heritage site, one of only a handful of Baroque churches in the Philippines to receive such recognition. I knew nothing of this when I wandered by to shoot a few photos of the exterior otherwise I would have paid admission and stepped inside to check it out. 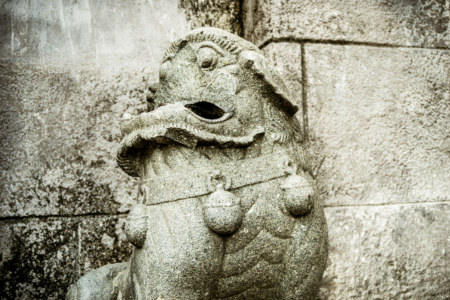 Just about the only interesting thing I can point out in my own photos is the presence of several Chinese-style guardian lions donated by Catholic Chinese. 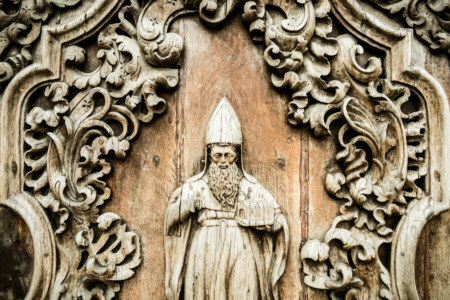 If you’re curious about the history of this church I recommend checking out this great article full of archival photos. The reconstructed Manila Cathedral in the center of Intramuros. 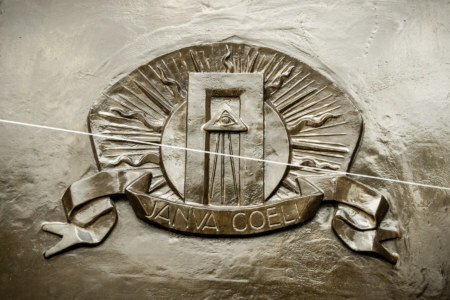 Eye in the pyramid on a door at the Old Manila Cathedral. 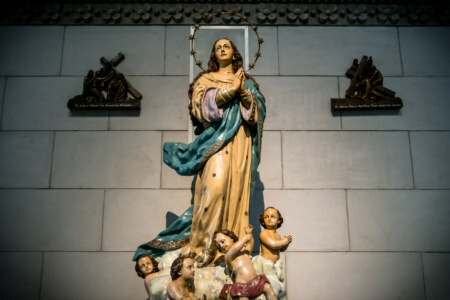 A statue inside the famous Manila Cathedral. A solemn atmosphere inside the Manila Cathedral. 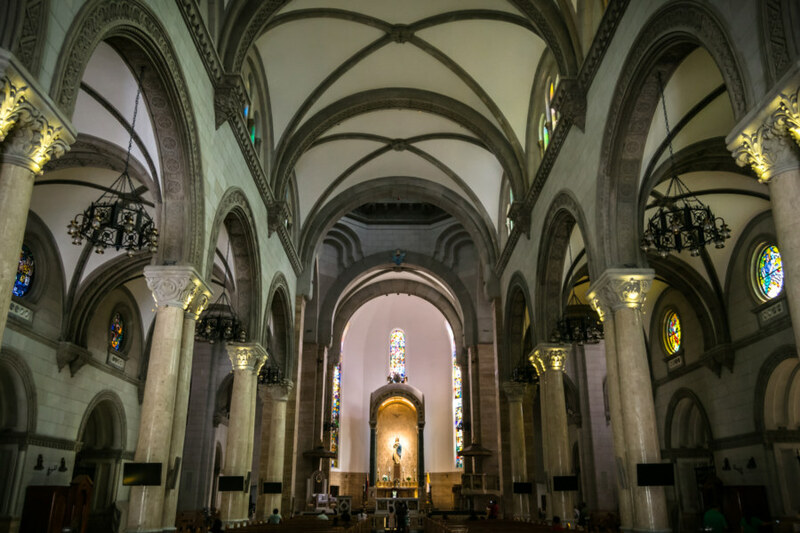 Intramuros was formerly home to seven churches but apart from the aforementioned San Agustin Church all were destroyed in the war. 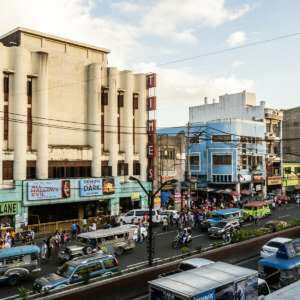 Of the remaining six, five were rebuilt elsewhere in Manila. 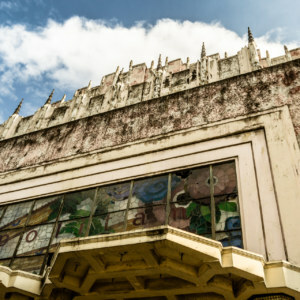 Only the eponymous Manila Cathedral, rebuilt in 1958, is located on its original site, in front of the Plaza de Roma. 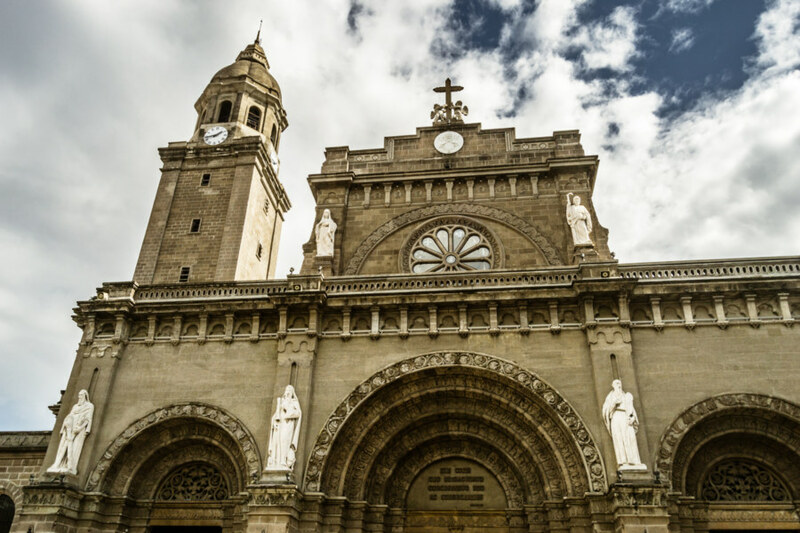 Formally known as the Minor Basilica of the Immaculate Conception, it was also destroyed and rebuilt numerous times over the centuries, mostly by devastating earthquakes. From what I’ve read this is the eighth church built on this site, which seems quite incredible to me. This time around I did step inside to take a look around, though I must admit that I don’t know very much about Catholic architecture or religious imagery and didn’t notice anything extraordinary. 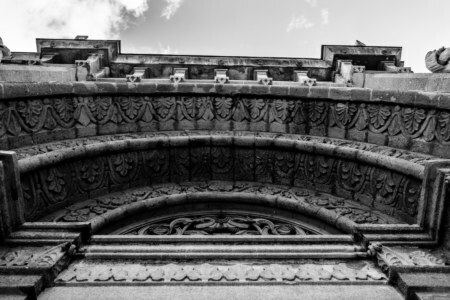 Archway detail from the eighth church built on this site. Max’s abandoned restaurant on the way to the old fort. Crossing the moat into Fort Santiago. 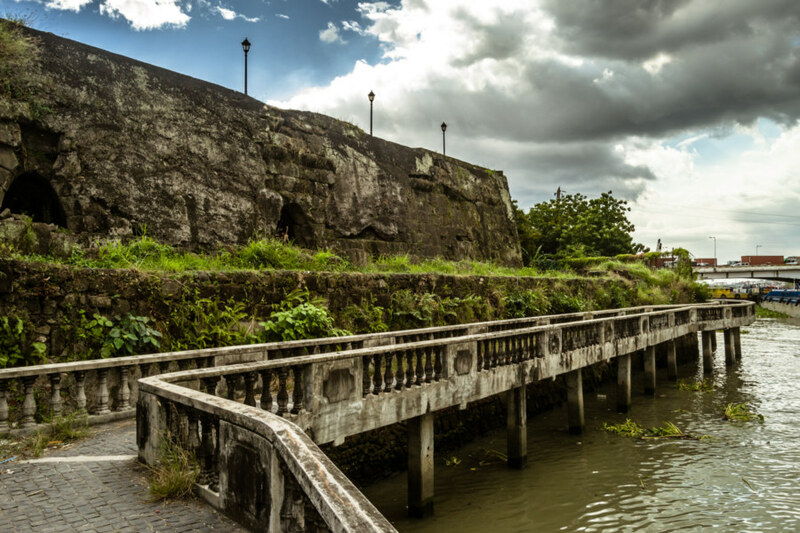 Fort Santiago is located on the edge of Intramuros at the mouth of the Pasig River. 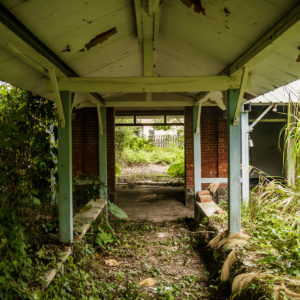 It also dates back to the late 16th century and has undergone centuries of destruction, modification, and renewal. 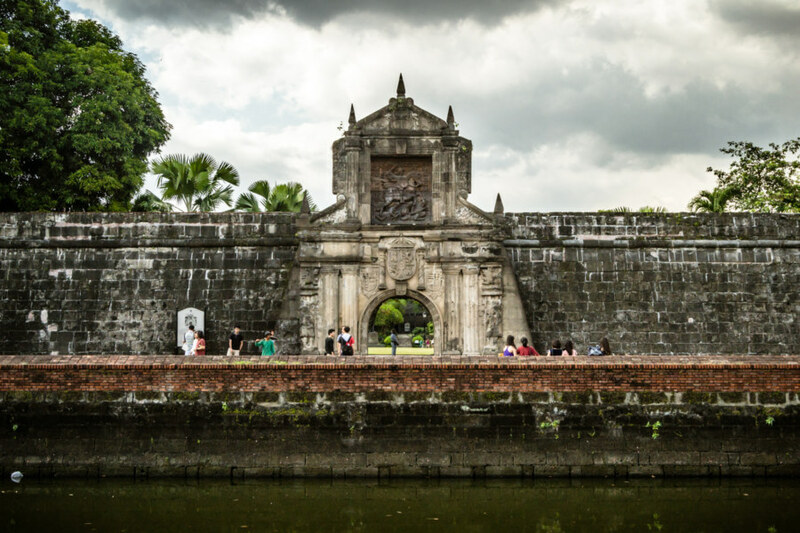 As with most of the rest of Intramuros it was heavily damaged in the war and the famous gate is entirely reconstructed. 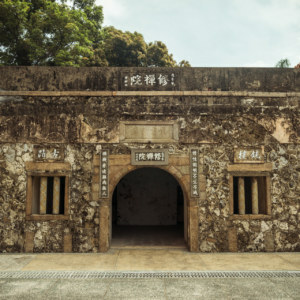 Apart from serving a defensive function it was also a notorious prison in colonial times and again during the war. José Rizal, a national hero, was executed here in 1896, and a former barracks now houses the Rizal Shrine, a small museum documenting his life and death. 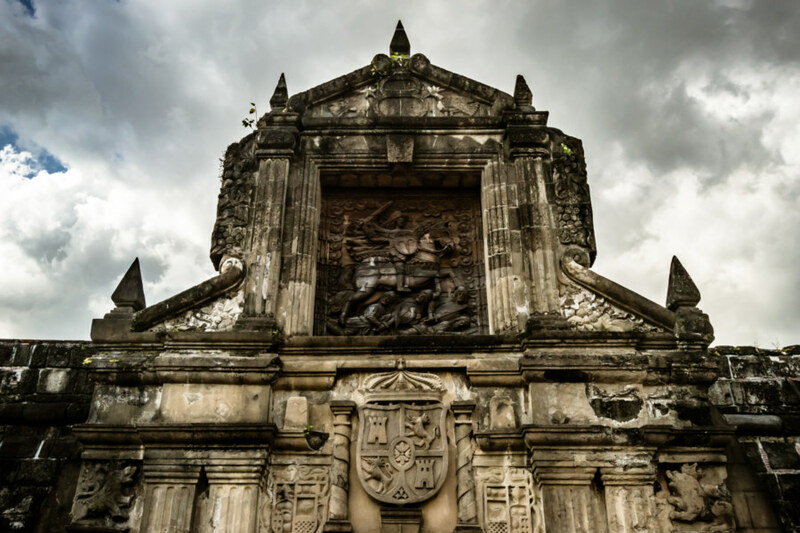 A closer look at the gateway to Fort Santiago, adorned with an image of Saint James. The ruins of what was apparently an old theater within the courtyard of Fort Santiago. 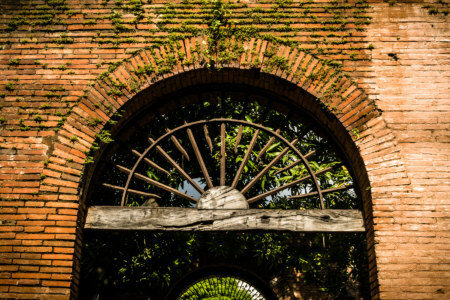 Remnants of the past inside the Fort Santiago compound. I’m not too sure what this structure once was. 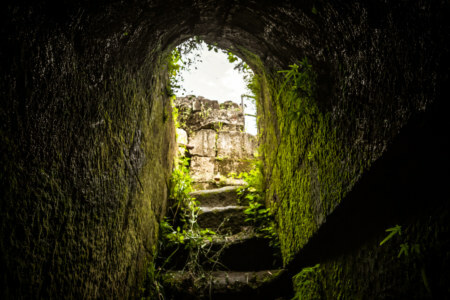 Peering out from the dungeons of Fort Santiago. Allied POWs were imprisoned here during the war and hundreds perished due to inhumane conditions. 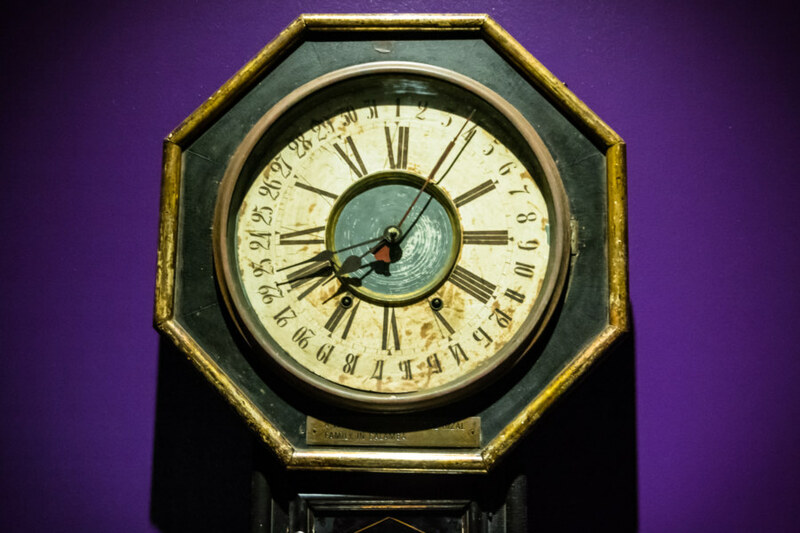 This antique clock inside the Rizal Shrine notes the moment of his execution: five past seven in the morning of December 30th, 1896. 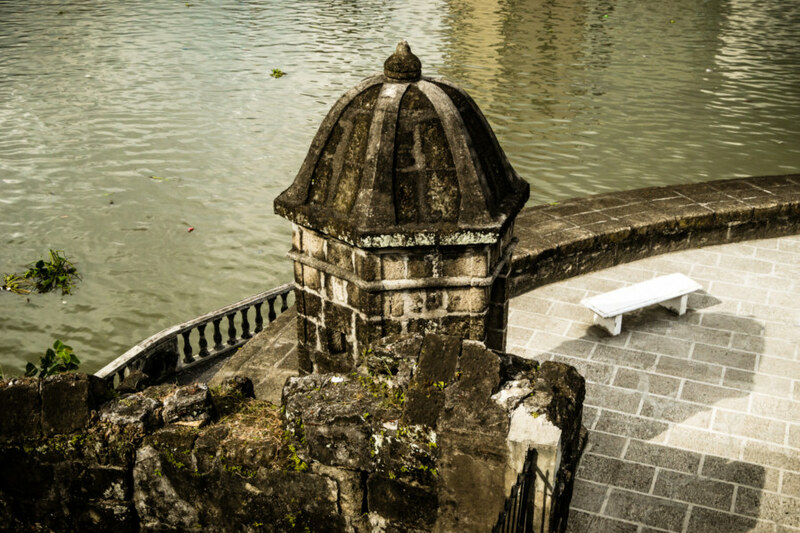 An old watchtower by the Pasig River. Taking a stroll along a poorly maintained walkway running along the Pasig River just outside the walls of Fort Santiago. Most of Intramuros may be as ersatz as Gyeongbokgung in Seoul but there is no escaping the weight of history that pervades the humid tropical air within these walls. Now having done a little more reading into what I saw that day I can appreciate the immense challenge of recreating an entire city transformed into dust by an immense battle that claimed the lives of more than 100,000 souls. Intramuros from the rooftop of the Bayleaf Hotel. 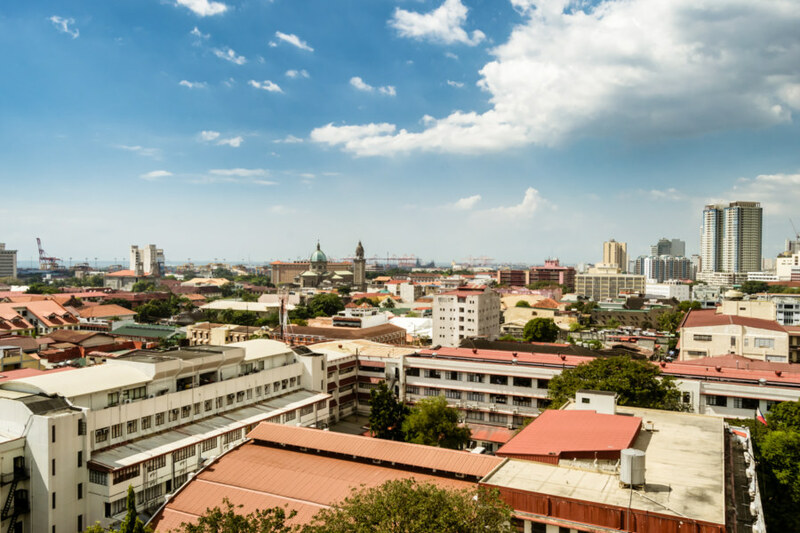 The Manila Cathedral can be seen just left of center and the San Agustin Church is also visible further to the left. 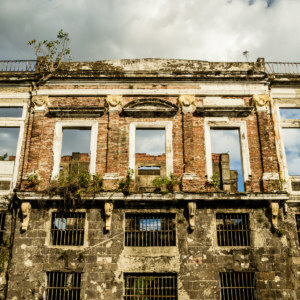 Following this brief walkabout within the walls I exited to the north and chanced upon the ruins of the Aduana Building, which I wrote an entire post about, before continuing to the Manila Metropolitan Theater. 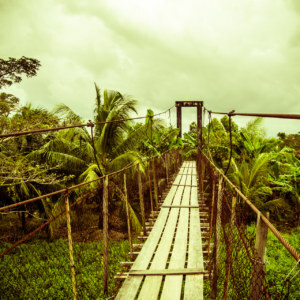 For more from this trip feel free to browse around posts filed under the Philippines.